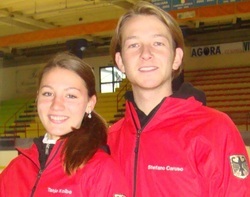 A 319 days from their participation in the European Championships in Sheffield (UK), where they gained an excellent 12th place, Tanja and Stefano return to the international competitions. A series of injuries did not allow them to participate in competitions since the beginning of the season but now they are ready to confirm (and possibly improve) the excellent results achieved in 2011-2013. 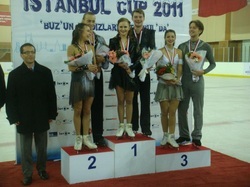 On 14 and 15 December the two athletes will be engaged in a tough international competition (Golden Spin of Zagreb), which will be attended by some of the best European couples. 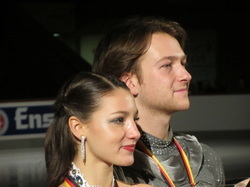 On 21 and 22 December Tanja and Stefano will be engaged to defend the German championships silver medal won in the last season and, if possible, improve on to the delight of their fans. We are really happy with our performance! We did a strong free dance, between us was something special today! We want to dedicate this program to all our fan, friends, family and coaches!! Thank you everybody!!!!!! Another amazing day has started! Finally the competition! Practice was really good, our starting number was number three just right after our team mates Marco & Charlene who picked up number two. 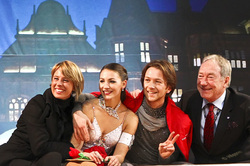 The ice was a bit busy ‘cause of the five couples on the ice but everybody survived as always! We always take good care of each other. This year is really difficult due to the new Circular no touching step sequence because everybody is doing nor clockwise either anti-clockwise so we all must be really caring. Yesterday was a pretty easy day for us because we had no competition. We had two times practice. The practice in the morning was the first practice in the practice rink which is also nice, the ice is good and some people came to watch. We were practicing Short Dance and we rather enjoyed it. Our long day started with wake up at 6 a.m.! We had a nice breakfast and we took the bus for our practice. All judges were there but, unfortunately, since it was so early in the morning, not a lot of public. Despite a major mistake in our last lift in out Free Dance, we made it. With 71.05 points we have earned the qualification to our first european Championship. We'd like to thank our coaches Barbara Fusar Poli and Martin Skotnicky for their wonderful support. We are the ice dance couple Tanja Kolbe & Stefano Caruso and last time we were reporting from the international Ice Skating Competition in Finland. It was a pretty dramatic competition for us and we hope the reports from the European Championships will be exciting too -- but hopefully not that dramatic. 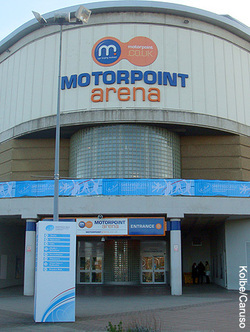 Thursday, 19 January 2012 21:29	Thirty-one teams from 21 countries will compete for medals, prize money and the all important ISU rank points at the 2012 European Championships in Sheffield, England. Of the 31 teams on the roster, 12 have direct entry to the short dance, while 19 will compete for the remaining eight short dance spots. Yesterday, after the closing ceremony of the German National Championship, the list of participants of the German Team to European Championship was officially announced. We are proud to represent Germany in Sheffield. This competition was a little hard to get through but we did it!!! We’ll keep working and training hard for the next competition. Thank to everybody for the wonderful support. E ci saremo anche noi! Mi raccomando, non mancate se volete vederci anche perchè sarà la nostra unica data italiana. After the Short Dance our goal was to do our best with the Free Dance and we are happy with our skating earning 130.98 points and 3rd Place overall. Thanks to everybody supported us! We'd like to say just a few words about our competition in Zagreb. 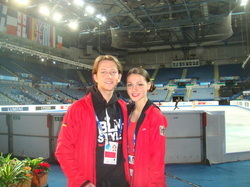 I think we did a good Short Dance and we’re also feeling much more solid and confident with the rumba than before. We earned 53.10 points and we were in the 5th place. With our Free Dance we earned 70,76 points, it was not a bad skating but unfortinately I did an important mistake, I didn't catch my leg in the twizzle so we lost points, finisching in the 6th place. 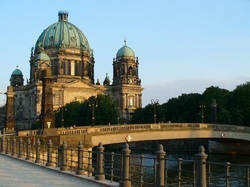 So, here we are with a short blog about our journey in Berlin! Right after Dortmund we came by car with Tanja's parents to Berlin. We are here until the 16th of November because we've planned to train with Mr. Martin Skotnicky. In Berlin is already winter right now. It's really cold but at least the sun is shining in the sky and it makes us feel happier! We are working basically on our weakness, we already changed our midline step sequence in the free dance and we are also improving and cleaning our choreography of both the programs. Doing the compulsory dance with Mr. Skotnicky is really nice, you can tell he has a huge experience of training and he makes us feeling really good! Training does not is always at the same place/rink, we are actually skating in 4 ice rinks. Three are in one place (in Sport forum) and the other one is a single ice rink. 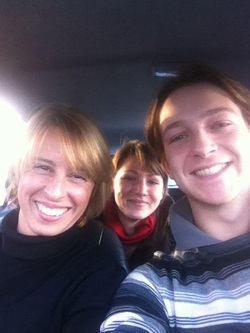 All of them are very close to Tanja's apartment so we get there quickly from home! It’s also nice to stay here because we have a lot of friends in the city and we do not have the opportunity to see them so often. In conclusione everything is going well and we're happy with each other. We still have a bit of training time before our next competition, which should be Zagreb at the beginning of December. Thank you everybody for the support! New updates will come shortly! 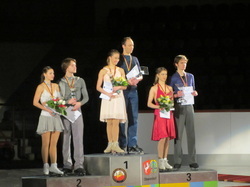 Today we are very happy because it was the first time since we are skating together that we won an international competition. It's Sunday and actually at Sundays you normally just want to lie in bed and sleep and relax, but we had to pull ourselves together and skate a good competition. What a day so far!!! Wake up was very early today, we were on the ice practicing our Short Dance already at 7.40 am!!! It’s always nice to see all the skaters already with make-up, nice costumes and a rising smile on the face so early in the morning! so now we are in Dortmund like we wrote it yesterday already. We arrived yesterday and today we had just one practice of Free Dance. It was nice weather in Dortmund and so I went for a walk with my parents. I don´t see them often because they live in Berlin and we train mostly in Milan, in Italy. Another week, another competition…! Just last week we were in Nice with 22° and such a wonderful weather…competition was going really smooth and now we are in Dortmund for the NRW Trophy. 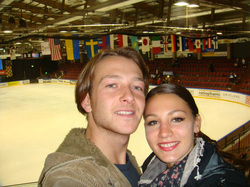 The trip was quite long, plane from Milano to Dusseldorf, then Bus and finally we arrived at the rink. NRW Trophy Dortmund 2011 - We're coming. Our next competition is going to be just in a couple of days. 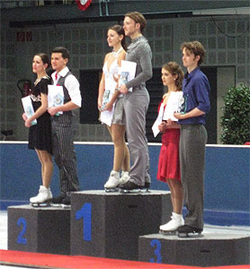 "NRW TROPHY DORTMUND", in Germany. We’ll try blogging from Dortmund and in the mean time you can follow us on this webside. So we’re here again just to say few words about our competition we had in France. 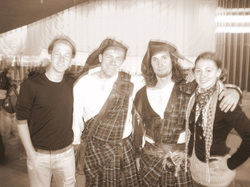 For us it was a very short competition, just both of the segments in two days and mostly we competed during night time. Now I am at the airport waiting for the plane to bring us back home. Today was a tough day for Tanja. We woke up very early, like 6.15 am and after a quick breakfast we went to the ice rink for the FD practice. Her scarf on the shin war swollen and really hearting even more than yesterday and the day before. During the practice we did quickly a check-up of all the elements and we decided to go out. Finnlandia Trophy - 3° day. After what happened to my partner yesterday this morning we woke up without knowing if we will be able to compete or not. Short after breakfast she decided that she would like to try to skate at the practice. We skated really well, just a short practice, we did all the elements and then we went out the ice. Today we had practice in the afternoon, so the day started well, we slept long and had a nice breakfast. The whole day the weather was bad, it was raining, so we went with our coach Barbara Fusar Poli and our Italian friends and training mates, Charlene Guignard and Marco Fabbri to the nearest shopping center. This is a link to a little blog from us about our first competition this season in Finnland. Blog - Tanja Kolbe & Stefano Caruso with some more photos .